Some random stuff that I’ve been looking at lately. i18next-parser (https://github.com/i18next/i18next-parser) – Command line and gulp plugin that parses your code and extracts the translation keys in it. i18next-webtranslate (http://i18next.com/pages/ext_webtranslate.html) – UI to edit your resource files. 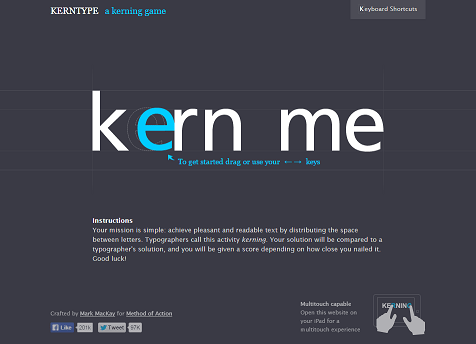 KERNTYPE a kerning game (http://type.method.ac/) – A fun game for practice manual kerning of text. More games at http://method.ac. Install Java SE Development Kit 7 (Java 7 SDK).Â You can test that it is installed by going to a command line and type “java -version”.Â If all is well you will see the version displayed.